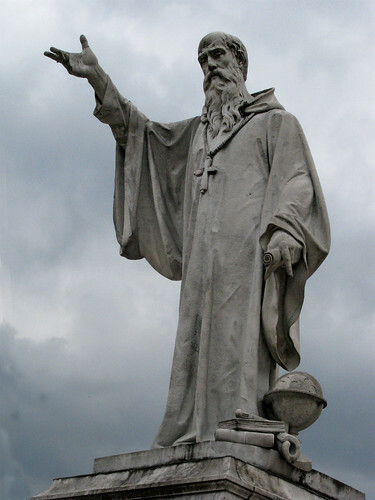 Statue of Benedict, Norcia Town Square, originally uploaded by Edith OSB. Norcia is still a very traditional place. Besides tourists come to see the birthplace of St. Benedict, they get income from hikers climbing in the mountains (we saw snow caps as we came up the steep and windy mountain passes). They are also famous for their hams, sausages and salamis, which one can see hanging in stores all over town. They sell a variety of products made from wild boars – and the head of a wild boar, stuffed and mounted, is as common in Norcia as are racks of deer antlers in Northern Minnesota. What good does it do for a 21st century American Benedictine to visit this small town a remote area of Italy? Well, I discovered that there were hermit-monks living in the area when he grew up. St. Eutizio lived in a cave just down the road from Norcia, and was reknowned for his holy way of life – so much so that St. Gregory recounted the story of his life in one of the other volumes of his Dialogues. Growing up in a devoutly Chrisitan household in a remote region, he surely knew of these monks, of their way of life, and their connection to the Gospel. There is no record that he was particularly attracted to them – but certainly there was an image, a pattern, to which he could later turn. After two weeks of visiting house churches, basilicas, the ruins of classical Rome, the city of Norcia stands in sharp contrast. It is still contained within medieval walls with seven gates – with small shops selling bread, church bells ringing to tell the time, cobblestone streets and a friendly, slower pace of life. We could walk from one side of the city to the other in a few minutes. There were no trains, trams, or buses; no pickpockets to worry about; no jostling crowds. Even all these centuries later, it was easy to understand the shock that Benedict must have felt when he came to Rome to study. Do you know of any resources on the Dialogues of Gregory regarding the stories of Benedict’s life besides Kardong’s? I have his and am using it for a class. I am looking for more info if there is any. Hope you are doing well and enjoying the summer.